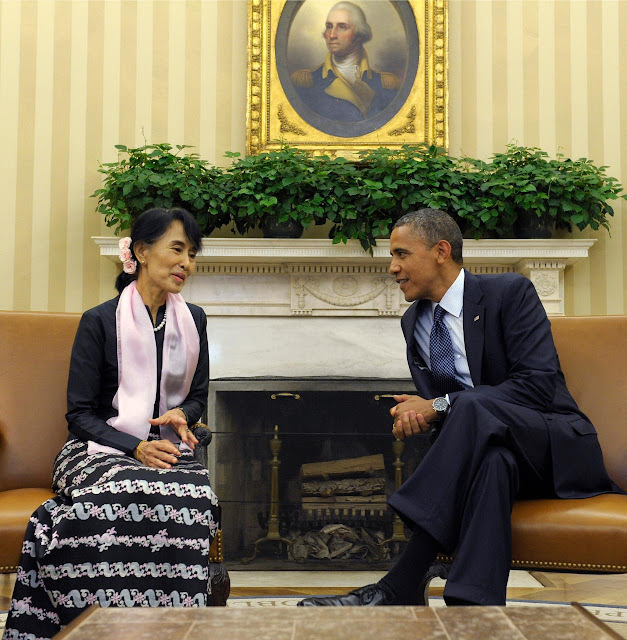 President Barack Obama meets with Myanmar democracy leader Aung San Suu Kyi in the Oval Office of the White House, Wednesday, Sept. 19, 2012, in Washington. WASHINGTON (AP) — Myanmar democracy leader Aung San Suu Kyi meets Wednesday with President Barack Obama and will be presented with Congress' highest award, signs of Washington's deep admiration for one of the world's most famous political dissidents. 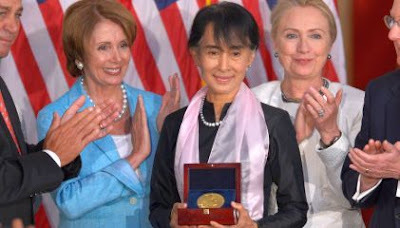 But the Obama administration was careful to balance the praise for the Nobel laureate with recognition for the reformist former military leader she is working with as the country also known as Burma embarks on democratic change. Treasury announced it was taking President Thein Sein and a top aide off its list of sanctioned individuals. Suu Kyi is on a 17-day trip to the U.S. She spent 15 years under house arrest for opposing military rule. Obama will meet privately with Suu Kyi at the White House. White House spokesman Jay Carney said Obama was looking forward very much to the visit, "as it provides another opportunity to reaffirm our long-standing support for her struggle and the struggle of many others toward democratic, just and transparent governance in Burma." A senior administration official, who requested anonymity in order to discuss the protocol surrounding the meeting, said there would be no news coverage because Suu Kyi is not a head of state. That also likely reflects concerns that her Washington visit could overshadow Thein Sein, who attends the annual gathering of world leaders at the U.N. General Assembly in New York next week. Myanmar opposition leader Aung San Suu Kyi met President Barack Obama at the White House and was presented with the Congressional Gold Medal for her long fight for democracy in a country ruled by army generals since 1962. Thein Sein is a member of Myanmar's former ruling junta who has led the political opening over the past two years that was heralded by Suu Kyi's release in late 2010. Suu Kyi has since been elected to parliament. As a result, the U.S. normalized diplomatic relations with Myanmar and in July allowed U.S. companies to start investing there again. The administration is now considering easing the main plank of its remaining sanctions, a ban on imports. 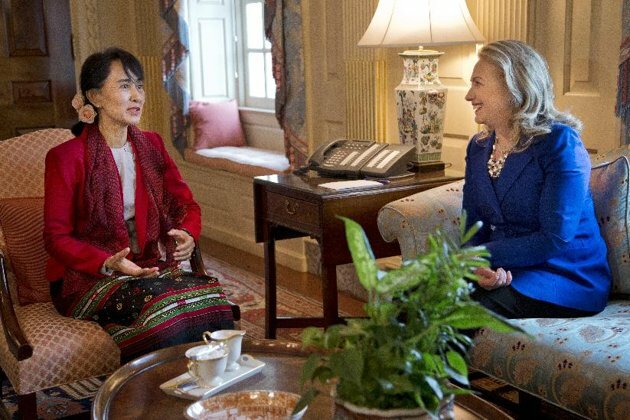 Secretary of State Hillary Rodham Clinton, right, meets with Myanmar democracy leader Aung San Suu Kyi at the State Department on Tuesday, Sept. 18, 2012 in Washington. Suu Kyi voiced support for that step after she met Secretary of State Hillary Rodham Clinton on Tuesday, saying Myanmar should not depend on the U.S. to keep up its momentum for democracy. Some of her supporters, however, oppose it, saying reforms have not taken root and Washington will lose leverage with Myanmar, which still faces serious human rights issues. Clinton also expressed concern Tuesday that Myanmar retains some military contacts with North Korea.